Across industries, organizations recognize the power and opportunity that comes with a fast and effective analytics and data visualization tool. Business intelligence (BI) is a must for uncovering valuable insights and staying ahead of the competition. To be successful, companies need a modern, easy-to-use BI platform that stands up as an industry leader and a vision that meets the needs of tomorrow. 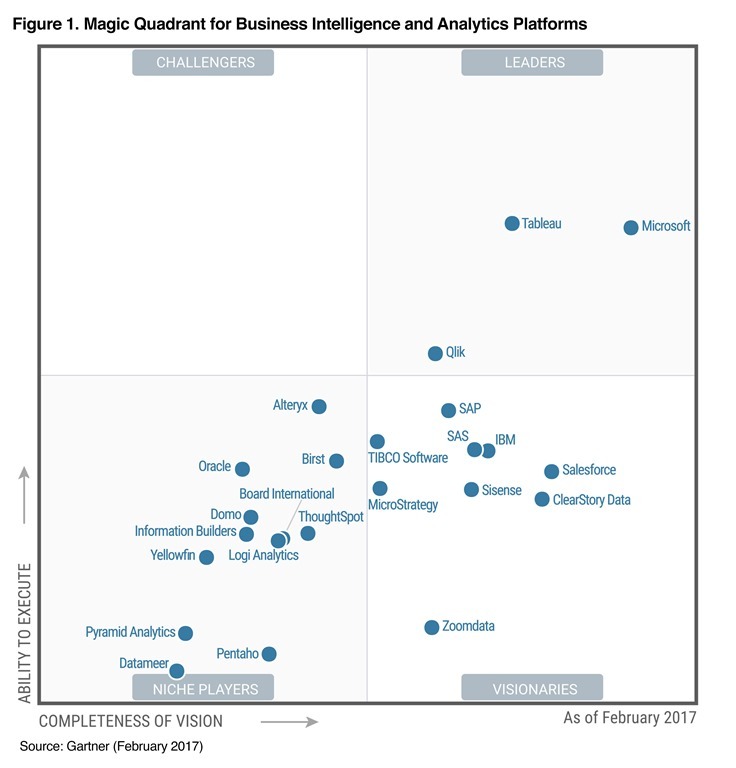 As Kamal Hathi, General Manager, Microsoft Power BI announced today at the Microsoft Blog, Gartner has recognized our vision and execution for the tenth consecutive year, positioning Microsoft as a Leader in the Magic Quadrant for Business Intelligence and Analytics Platforms. 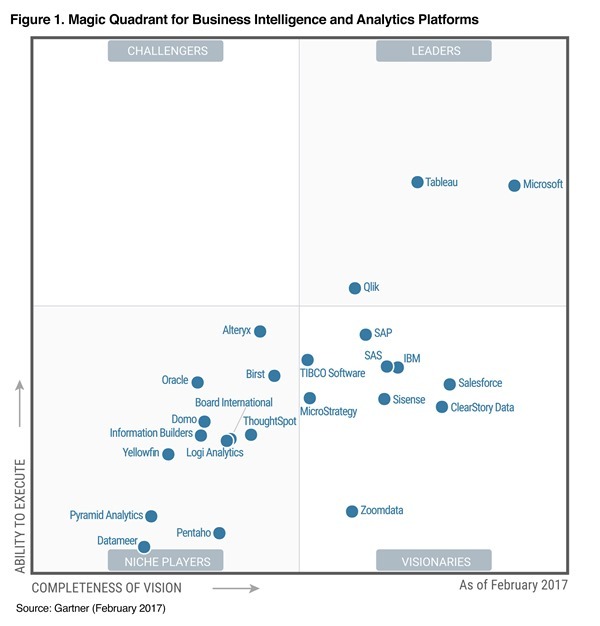 * Also, for second year in row, Microsoft is placed furthest in vision within the Leaders quadrant. In a market that is constantly evolving with new innovations, leaders must demonstrate they are focused not only on current execution, but have a robust roadmap for the future. Microsoft engineers, partners and users collaborate to continually upgrade Power BI, so its tools get better every day, protecting the investment of today’s buyers. The strong placement for Microsoft could only have been made possible through the hard work of our many engineers and testers who listened over the years to users of Excel and Power BI to expand the capabilities and drive new benefits. We also must thank the more than 200,000 organizations in 205 countries that are now using Power BI. Just as businesses strive to find an edge against industry foes, Microsoft is determined to deliver modern BI and analytics solutions for all types of users and to remain a leader and visionary in a competitive BI platform environment. Microsoft and Power BI stand out — and the users benefit. The technologies behind Power BI enable users to create and share insights in real time. With Power BI, anyone can develop rich and compelling stories that perfectly visualize data. And Power BI offers the ability to create custom visuals that are uniquely tailored to suit user needs. Get the report here and learn more about Microsoft’s standing in Gartner’s 2017 report and how businesses can make a competitive difference. If you will be at Gartner Data & Analytics Summit this upcoming March, don’t forget to stop by the Microsoft booth and experience live Microsoft’s vision for BI and Analytics. Last but not least, we just announced that you can join us in Seattle this coming June for the second annual Microsoft Data Insights Summit. Users from all around the world will come to Seattle to meet with the Power BI team, attend sessions, and network with fellow data enthusiasts. Find out more now and register on the Microsoft Data Insights Summit site.